Health care talks began anew on Tuesday, with Democrats pledging to send a final bill to President Obama before the State of the Union Address. But the looming issue of three senators opting for retirement has shaken the party. In a White House meeting Tuesday evening, Obama and Democratic leaders agreed on a fast-track alternative to the traditional House-Senate conference committee. The informal approach would still require the House and Senate to pass identical bills but would minimize the opportunity for Senate Republicans — who united in opposition to the legislation — to slow the process. Under the plan, the House would pass the Senate bill amended with new compromise provisions, then send the package back to the Senate for one final vote. Republicans decried the move as a breach of Obama's transparency pledge, while some House liberals objected to losing the public forum that a conference committee would have provided. Even C-SPAN, the cable television network devoted to public affairs programming, complained about the closed-door finale to a process destined to "affect the lives of every single American," as Brian P. Lamb, the network's chairman, wrote to House and Senate leaders on Dec. 30. However, the time to deploy such tactics are quickly waning, as two Democratic senators and one governor in a key state have announced their decisions not to run for re-election this year. 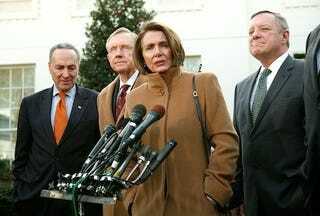 Four top Democrats-including veteran Sens. Chris Dodd and Byron Dorgan-all prepared to pull the plug on their campaigns in a 24-hour period that began Tuesday, and in the process, offered an unnerving glimpse at the perilous election year ahead. With Dorgan's stunning retirement announcement Tuesday evening, Democrats are now facing their bleakest election outlook in years-and the very real possibility the party will lose its 60-40 Senate supermajority after the November elections. On the House side, the prospect of heavy 20-30 seat losses is already looking increasingly likely. While speculation is already running wild, not much will be known about the mood of the country moving into the election cycle until we see the final results on health care reform.